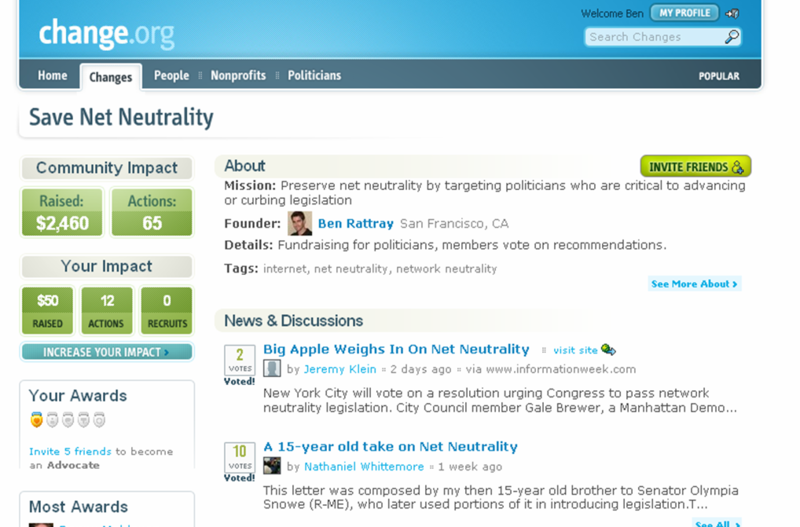 We covered the social activist community Change.org when they first launched back in February. The site is one of a few philanthropic startups tailoring the latest web features for non-profits and politics. It is a social networking site that serves as a resource for researching and organizing groups around social and political causes, called “Changes”. Changes are a place for members to post related images, videos, blog posts, and donate time or money to the relevant nonprofits. Tonight, Change.org is launching an ambitious version 2.0 that expands beyond nonprofits and into political fundraising and lobbying. Founder Ben Rattray says politicians are expected to raise over $3 billion in this election cycle, with about half of that spent on fund raising (running total here). He says nonprofits receive donations upwards of $250 billion a year, with $50 billion of that money spent on chasing down a donors. Change.org wants to lower those fund raising costs, counteract large donor’s “special interest” money, and help give a voice to the average Joe who can’t afford a $2,500 a plate dinner. To accomplish this, Change.org has effectively turned each “Change” group into a political action committee (PAC) by adding a database of politician profiles and some extra features to the “Change” groups. Now each group has the power to pool together a pot of money to donate to relevant charities or political candidates, as well as the power to lobby your representatives. Instead of only nominating one charity per group, members can now vote on who which charities or politicians can best enact the change they want. Any member of the group will be able to submit a candidate for the donation, but only people who donate to the group’s “piggy bank” ($10 min by credit) will be able to vote the candidates up or down the list. Donations can be raised through the main site or an embeddable widget. At the end of the month, all the money in the piggy bank will be divided between the top “n” donation candidate(s) (3 by default), minus a 1% management fee to sustain Change.org. If the money is raised for a political candidate, that candidate will get a check for the amount and their opponent will get slapped with a novelty check for the negative amount, just to let the competition know you mean business. Donations can also be conditional, such as donations to whoever wins the Democratic or Republican primary. Change.org will distribute the money when a winner is determined. If putting your money where you mouth is isn’t your deal, you can also try lobbying on behalf of the group. Lobbying campaigns are dead simple. It just requires you to check off which representatives you want to lobby (state/federal, house/senate, governor/president), enter your address, and then type out a short message about your cause. The system automatically sends the message off to the appropriate representatives based on your address. The announcement of the campaign is then posted to the group and the politicians profile along with a copy of you message. If the representative responds, members can post the response to the campaign page. In exchange for your good will, Change.org will dish back some warm fuzzies in the form of a scoreboard listing the total money you raised for change and virtual award medals of your contributions. Awards and posting a scoreboard will help generate some social pressure for friends to take action. We have yet to see how it will stack up against Sean Parker’s viral monster for good will, Project Agape, however. In a time where nearly every presidential candidate has a MySpace page, it’s evident that the web is has developed some formidable political muscle. Today’s activists are co-opting new media sites like YouTube to get their messages out (see “Vote Different“). Change.org places yet another arrow in their quiver. Activists should also check out idealist.org, dotherightthing.com, six degrees, tree nation, and essembly.com.